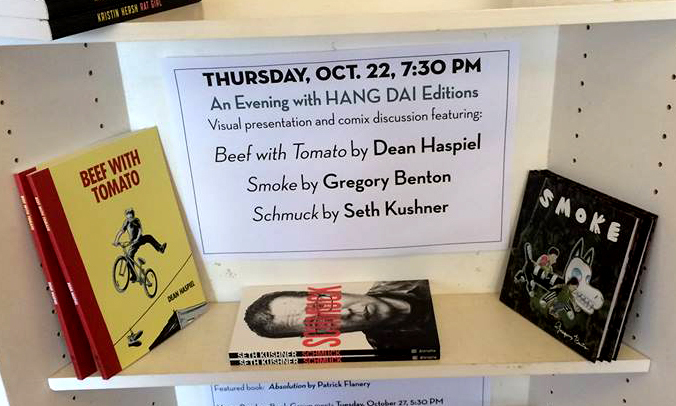 Greenlight welcomes Dean Haspiel and Gregory Benton to present their new titles, and salutes the late Seth Kushner, at this evening showcasing the newest books from HANG DAI with a visual presentation and discussion moderated by Josh Neufeld. 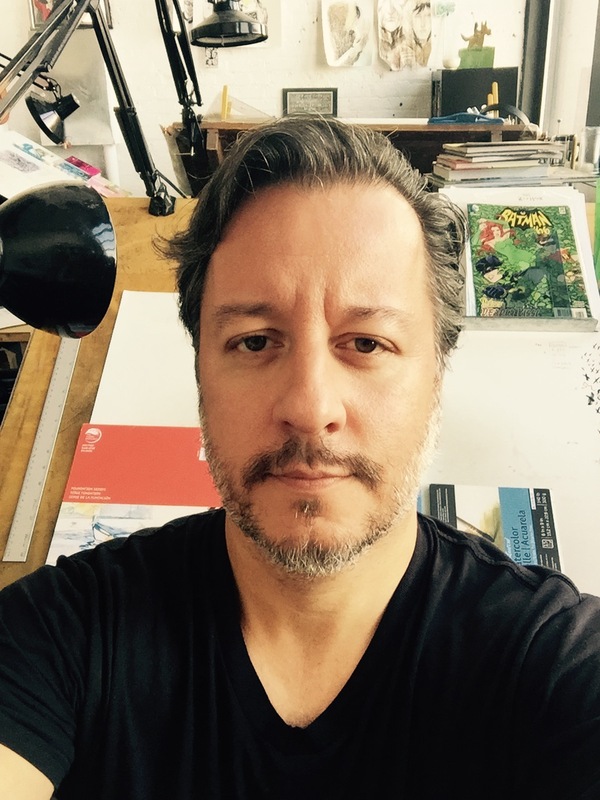 Reporter Cesar Bustamante, Jr. interviewed Dean Haspiel about his graphic novel, BEEF WITH TOMATO, for The NY Daily News. “It’s funny because when I was first walking down the street in Carroll Gardens I would see the old Italians, they would be eyeballing me. I think they looked at me and thought I was some kind of rich yuppie. Because they wouldn’t know I was a struggling cartoonist. I just looked like some white guy invading their neighborhood. “Working with Harvey Pekar was a learning experience of what to do and what not to do in autobio comics. What I really loved about Harvey Pekar’s writing was his ability to observe and listen to other people’s talking, how they talk and what they say and how that can possibly turn into a story, no matter how mundane the event is. He was very good at highlighting the quotidian aspects of life. “New York City is the most heartbreaking city in the world. I think people go to Paris to fall in love, they must go to New York to break their hearts. As a true blue New Yorker, I have fully invested my life and my energies and my soul into this city as it hopefully has to me. But the older I get, and the more I work as an artist in the city… I’m standing in a building right now in Gowanus that we have been given maybe a year or two left that we can work here and then we’re going to be kicked out so that developers can turn this into expensive office buildings or another CVS, another bank. It’s already happened next door to us. People have been given one month’s notice after making this area cool with its art. “Have you ever broken up with someone or they broke up who you, the writing was on the wall but you kept trying over and over again to make it work. I guess this is my shattered woo, my broken woo to try to make it work still with New York City before I bite the bullet and leave. The city is what you make it so I can’t blame this inanimate object on what’s been happening but I can still fight and try. I do love the city, whenever I visit any other place in the world, anytime I come back to New York it still feels like home. I don’t want to abandon it. It’s hard to abandon. In a way living in New York City is a relationship between a person and the landscape. And I know enough New Yorkers that have left and not come back because maybe they’re afraid to come back. They’ve found a better quality of life outside of New York City. We’re not talking about rich New Yorkers. We’re talking about the artists, the working class and those kinds of folks. I always complain that I live in New York City but I can’t enjoy it’s virtues because I ride my bike from my studio to my home, back and forth seven days a week. Occasionally I might dip outside and do something in the city but I can’t afford it. I’m working too hard to pay my rent. 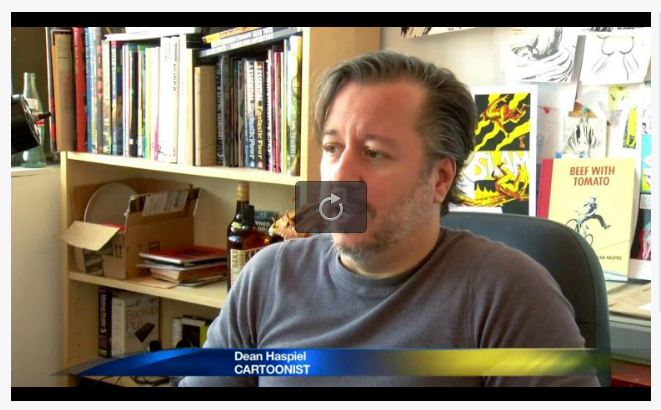 Reporter Esha Ray of News 12 Brooklyn interviewed Dean Haspiel about his new graphic novel, BEEF WITH TOMATO, and his upcoming webcomic series, THE RED HOOK, at his Gowanus, Brooklyn studio, Hang Dai. “A veteran Brooklyn cartoonist is creating a new comic series centered around the borough in an alternate universe. The 18-year borough resident says Brooklyn is a part of the city that doesn’t get much attention in comic books. 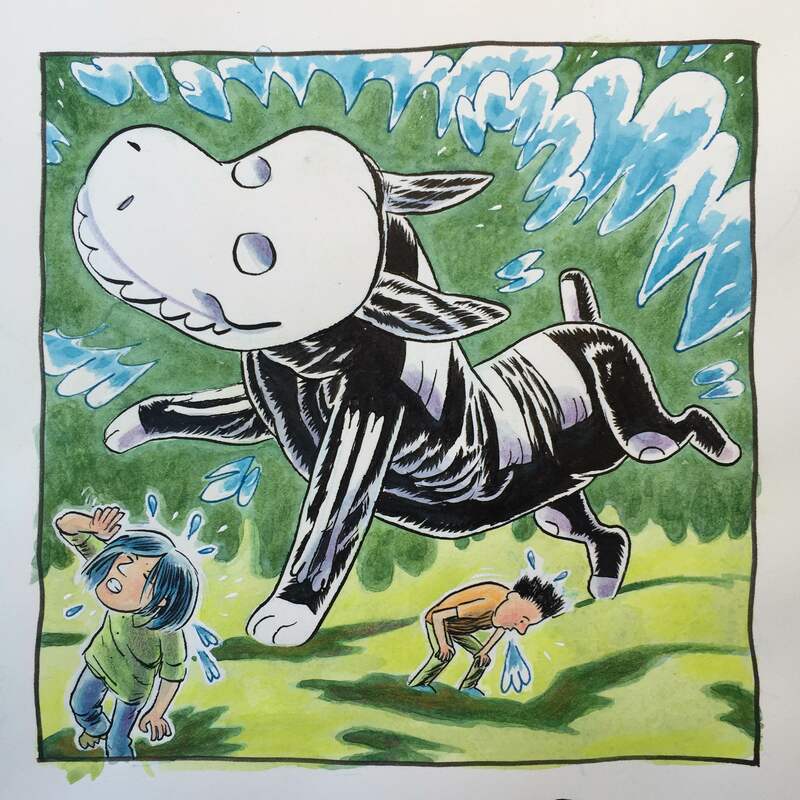 Gregory Benton will be signing at Escape Pod Comics, scribbling mini-Picassos inside copies SMOKE, B+F, and more! Dean Haspiel is participating in Gowanus Open Studios this weekend (Oct 17 & 18) from Noon – 6pm, Saturday & Sunday. Despite chronic back pain, Dean was planning on working anyway. So, he figured he’d keep the Hang Dai Studios door open for people to ogle cartoonists in their natural habitat like a petting zoo. 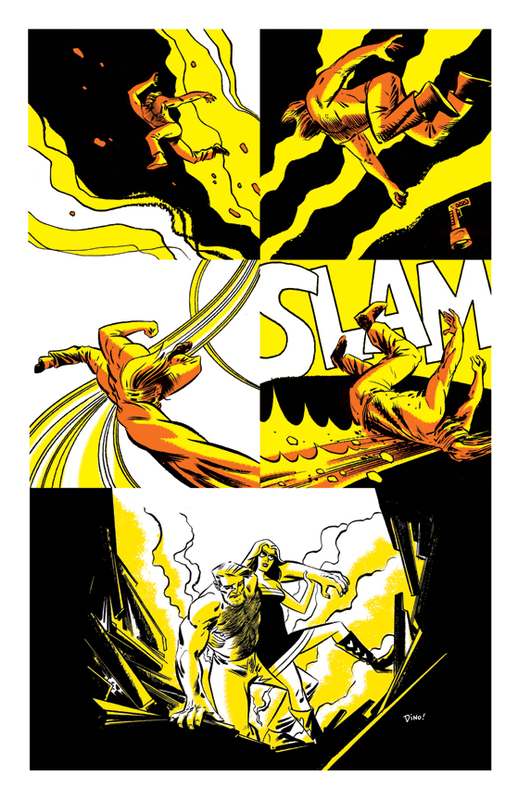 Dean will have prints and copies of some of his books for sale, including a brand new Billy Dogma SLAM print. And, he will be available for quick commissions. The warehouse he works in will feature over twenty other artists, including painter Jen Ferguson. Hang Dai is also hosting artist Krista Dragomer. Hang Dai Studios is located at 112 2nd avenue at the corner of 10th street in Gowanus, Brooklyn. We’re on the 2nd floor in Room #30.